This article originally appeared on Gradhacker.org on February 22nd, 2013. Anyone who had pursued a graduate level education knows that there is a great deal of work involved. At times, this workload can become overwhelming for any student once it follows you home and won’t leave. However, it is times like this that we have to think back to the iconic line from The Shining: “All work and no play makes Jack a dull boy.” Imagine him locked in that hotel with a thesis document or comprehensive exam to finish and suddenly Jack sounds like a burnt-out grad student. Keep the two separated to maximize productivity and minimize distraction. Blending work and play: You can take unpleasant tasks and pair them with another activity that you like so the total process is at least somewhat enjoyable. When I have a lot of reading to do I know there’s one way to make sure I enjoy it: run a bubble bath and open a beer. Is it a bit weird to read journal articles in the tub? Well, yes; but the great thing about it is that I usually finish all the reading I wanted to get done while getting to soak and relax. They are not mutually exclusive activities. It’s a win-win situation even if it is unorthodox and that is what really matters. What kind of pairings would you enjoy? It could be as simple as getting a really good espresso to drink while running data analysis on your computer or getting a nice, comfortable desk chair to work from. Find how to make the process as enjoyable as possible for yourself if the work is unavoidable.Nobody ever said that it has to be an unpleasant process to get results. 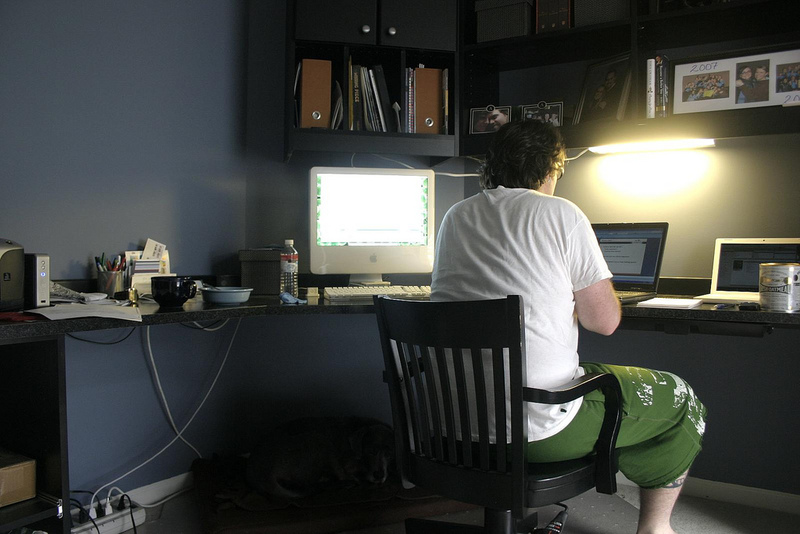 Keeping work in its place: At the other end of the spectrum in dealing with graduate work at home is keeping it in discreet pockets of time and space where it gets 100% of your focus. Some things you just have to give full attention to and there is no way around that fact. This may sound simple, but in practice I’ve found that it is almost anything but. I believe working from home can be a very good and productive practice as long as you don’t fall into common time-sinks such as having multiple web tabs open while working on the computer on an unrelated work project and hopping between them all while only reading half the page (I can’t be the only person who does this). When this happens you are spinning your wheels and not really helping yourself, just postponing the work with mindless activity. What needs to happen in this situation is the opposite of multitasking. Think of it as monotasking or working on an airplane (where I am currently writing this article): You can bring all the papers you need to read and use your computer, but web browsing is out. It’s amazing how much you can get done without distractions and there’s no reason that you can’t replicate that kind of focus at home. So find what works for you (quiet room, turn off the router, use a timer, etc) so that you can focus and finish your work in a timely manner. This is also important because it allows you to set specific time and/or task goals and then walk away to go play, relax, or otherwise recharge. That freedom to walk away from work knowing that it’s done or that you’ve at least met your goals goes a long way in making graduate school a manageable process. How else have you learned to focus on work while at home or to make the process more enjoyable? Please share your thoughts in the comments section below.